CMS launched their Lenten Project here in Tallaght on 29th January: ‘God’s Big Family’. The CMS Ireland annual project normally focuses on one county and highlights the work of just one of their Global Partners. This year, for their 200th Anniversary their annual project celebrates the work of all their partners as they worship and work in different ways in nine different countries. The project will help children and young people consider what it means to be part of the global church. The Good News Club will be hosting ‘coffee’ after family service on Sunday 23rd March. We began the month of February with our Good News Club teacher Grace giving thanks at the Communion rails for the recovery of her brother Arnold. He had been kidnapped two months previously in Kenya. He had been working as an advertisement executive when he was abducted and his colleagues blitzed the area with his photograph so it is thought that his captors released him due to his notoriety. Elizabeth Ogunjimi gave an thanksgiving offering at the Communion rails for the baptism of her son Joshua at our February Family Service. Joshua had been baptised the previous Saturday. On 8th February I was invited to Mount Seskin Community College’s chaplain, Paddy Doyle’s birthday meal in Reed’s on the River in Lucan. It was lovely to meet his friends, many of whom were teachers if not fellow chaplains. Paddy and I have worked together for a good number of years so I was delighted to be included in his birthday celebrations. During Lent we are using the Biblical Association of the Church of Ireland’s (BACI) themed biblical study which looks at the relationship between the church and today’s culture. There will be a Lenten Holy Communion Service each Wednesday at 10am. Please note earlier time to allow for coffee afterwards. On 11th February I attended a talk in the library on the three artists buried in St. Maelruain’s Grave Yard; Evie Hone, Oisín Kelly and Elizabeth Rivers. It was lovely to be joined at the talk by Oisín Kelly’s daughter, parishioner, Caitriona McCoy. The annual Garda Mass for M division was held on 17th February which I attended along with the Prior of St. Mary’s Fr Donal Sweeney. The Mother’s Union held a parenting talk in Lucan on 28th February which focused on the challenges of rearing children in Western Society. Would people in the Parish be interested if I were to bring it to Tallaght? Please let me know. There was a Tree Planting Ceremony for Tree Week on 7th March in Dodder Valley Park, ‘A Tree of Hope’ in memory of those who have died of suicide. Many of you will have noticed that work has now been completed on the new roof of the stables in the grounds of the Church. Thank you to the Flower Festival Committee for providing the funds for this project. Thank you also to our Glebe Warden Billy Gould for overseeing the work. Our Church boiler is limping along so we it was suggested that parishioners might bring along to Church any small change that they may have during Lent to start a fund for the replacement of the boiler. You might remember me in your prayer as I will be preaching in Christchurch Cathedral at the Holy Communion Service at 11am on Sunday 6th April, all welcome. God bless, William. It’s Mothering Sunday on 30th March, an opportunity to show your Mum how much you care! Don’t forget about the clocks going forward on the same day. For those of you who may be interested, RTE Radio One run a programme ‘The God Slot’ on Fridays at 10pm. It takes a contemporary look at religious affairs worldwide. MOTHER’S UNION / FAMILIES FIRST On Monday 10th February we had a large gathering, including members of Bohernabreena ICA to hear Alice Leahy Director and co-founder of TRUSTspeak on her work with the homeless. We raised €251.50 at the meeting towards this very worthy cause.. It truly was a memorable meeting. A big thank you to all who contributed so generously and donated clothing which I dropped in on Tuesday 11th February. I was given a tour of their facilities and met homeless awaiting their turn to use the wash facilities. Alice has produced two books “With Trust in Place” and “Wasting Time with People” and further information on her work is available on www.trust-ireland.ie. On Monday 10th March at 8pm Dr Shane Kenna spoke to us on Kilmainham Jail. Shane is son of our music group member Olive and has recently launched a book “War in the Shadows” based on his doctoral thesis which is a major contribution to the study of the period. His talk was very thought provoking. We were delighted to see Valerie and remember Ann, normally so faithfully at our meetings, who is unwell at this time. SAOIRSE would like sugar for April. Thank you to Eileen and Liz who offered to deliver the paper towels and black sacks collected for January and February, as the secretary had a car load of clothes to take to TRUST. 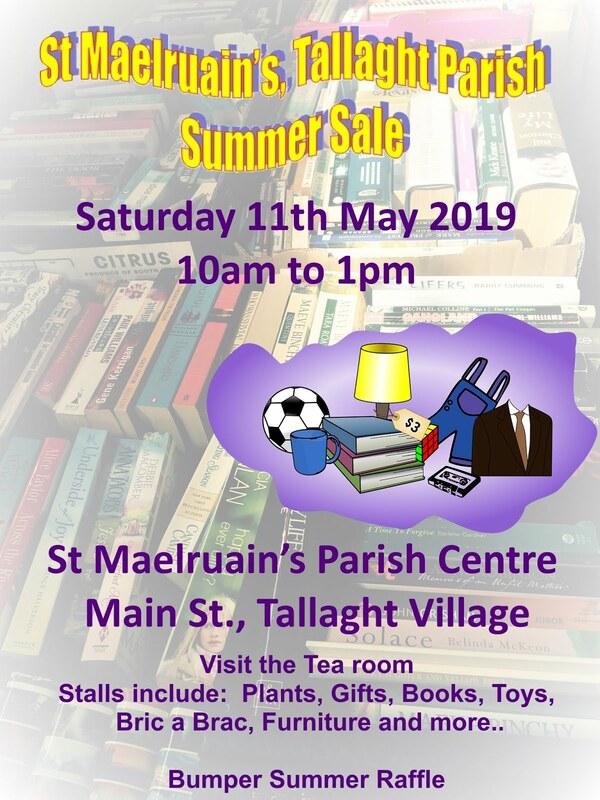 Our annual outing planned for 10th May has to be changed as the Parish Sale will now be on that date because of examinations. The outing will now be on Saturday 17th May to An Grianan. There will be a choice of workshops morning and afternoon, cookery or gardening, refreshments on arrival, four course lunch and high tea included – cost €70 per person. We are happy to collect €35 at our next meeting and €35 on the day OR you can pay in full on 14th April. 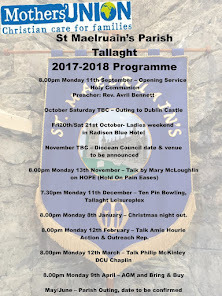 As usual, we welcome friends, neighbours, etc… If you have any further queries, please contact Janet on 0872943964 or Miriam 087 2939751. There will be a list in the porch, just add your name if you wish to come along. DATES for your Diary: Thursday 3rd April - 11.15 H.C. Christ Church Cathedral Monday 14th April – AGM & Bring & Buy Sale. New Committee will be elected at this meeting. TEA LADIES: Iris and Miriam. Our very best wishes to Valerie as she recovers from her accident. THE BOY’S BRIGADE.We are all looking forward now to our annual display which will take place on the earlier date of April 12th. Our chief guest this year will be Rev. Robert Kingston, former Rector . While the display will take place in April, Boys Brigade will continue to run on a relaxed basis with various activities in the planning. Our annual Good Friday hike will take place, when we are planning to take in Masseys Wood and the Hellfire Club. We hope all the boys will join us for this popular annual event. Parents are very welcome to join us too. We had two teams in the Eastern District juniors quiz and while they didn't win, did very well and enjoyed the night. Two boys are attending the Company Section Activity week end at Castle Saunderson in Cavan. We hope they enjoy what promises to be an action packed week end. Don't forget to mark your calendars.....12th April at 7.30. Display. THE GIRL’S BRIGADE The Girl’s Brigade display takes place on Saturday 5th April at 3.00pm. All parishioners welcome! 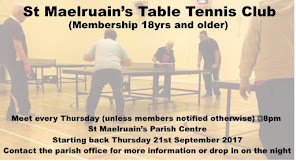 TABLE TENNIS Table tennis continues to run on Thursdays at 8.00 pm in the Parish Centre. We are looking for more members in order to keep the club up and running. All levels of players are welcome. It's a great social night, with play informal. We would welcome parishioners to come along and join us for an evening. It's a great way to keep fit! BOWLS CLUB We hasted the semi-final of the McIllwaine League cup between Whitechurch and Castleknock on Sat 1st March. Avery good match, Castleknock won. Our Rohu team reached the final and will play against Whitechurch on Thurs 6th March in Greystones. We wish them all the best. – Pat Dunne. 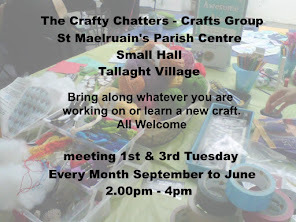 CRAFTY CHATTERS The Crafty Chatters are meeting on Tuesday 4th March and then on Tuesday 1st April at 2.15pm in the small hall. Please come and join us for an afternoon of chat, crafts, good company and fun. All Welcome! 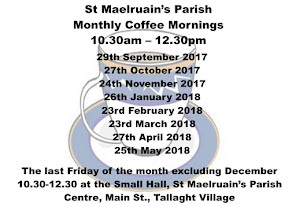 PARISH COFFEE MORNING Our next coffee morning in on Friday 28th March from 10.30am Do drop in for a cuppa and a chat. All welcome!